Now we have got the Christmas and New Year holidays out of the way, it is time to look forward to our holidays and our Travel Photography opportunities. This article is by Mark Eden, writing for our our friends at Picture Correct. Mark is a freelance photographer and the founder and director of Expanse Photography. A photographic services company offering fine art images as well as stock and assignment photography and a range of publishing and printing services. Mark ends his article by saying "more often than not it’s about being in the right place at the right time and having the awareness to take complete advantage of it.". 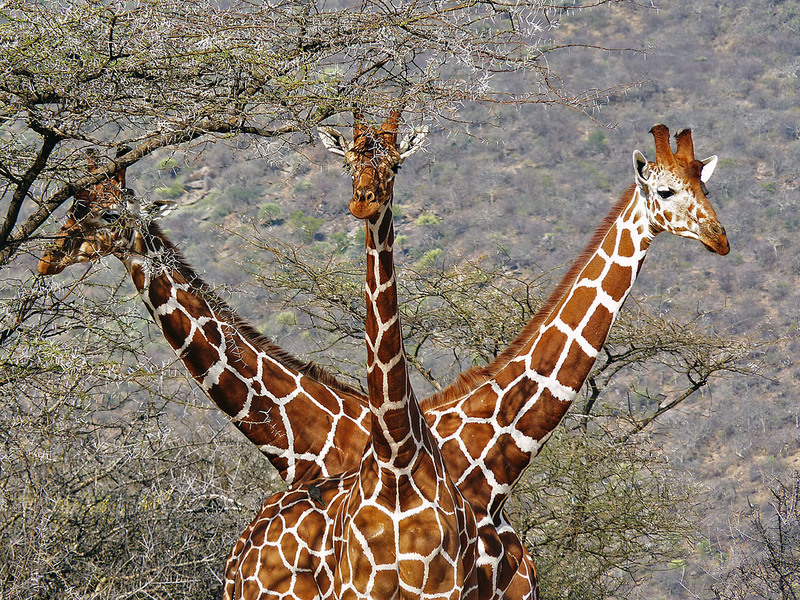 My most published image, that of the "Three Headed Giraffe", was precisely that. I turned round and saw the scene and knew there was a special photo there. You can own this image as original Wall Art, in a variety of formats including stretched canvas prints, from Fine Art America and Photo4Me - just click on the link below the image. A great article by Dan Waters writing for Digital Photography School, looking at ways to inspire photographers into undertaking exciting and rewarding new projects. Dan is one of the leading wedding photographers in Peterborough and also runs Get Pro Photo, a blog to help photographers with their photography marketing. We live in a new digital world of social media and computer games which makes it all too easy to keep the real world at arms-length. Do you ever find yourself thinking you want to do more, feel more and live more, but comfortable familiarity and lack of confidence holds you back? Think about why you love photography. For many of us it’s that we’re fascinated by the world we live in and want to share our vision of it. To create great photos you need to feel, but to feel more you may need to push yourself to do things that take you out of your comfort zone. Follow this link to read Dan's article in full...............Photography projects that make you feel alive. Many of us I suspect, have at one time or another, considered starting a 365 project, but if you are like me, you have felt that you do not have the time or commitment to start one. If you read this article by Katie McEnaney, for Digital Photography School, you may just motivate yourself to start something that will help improve your photography over the coming months! Katie is an educator and photographer from Madison, Wisconsin. Read more tips on her blog, Boost Your Photography. With the beginning of a new year, many people around the world take time to reflect on the past year and set goals or resolutions for the upcoming year. It’s a good time to ask yourself; “What do I want out of my photography this year?” For most of us, the response might be to improve our skills, to be inspired, and to find more time and energy to pursue our passions. No matter what you want out of your photography, your path to accomplishing your goals will require dedicated time and effort. An entertaining and thought provoking article from Paul Burwell for Digital Photography School. Paul is a professional photographer, writer, educator and enthusiastic naturalist with over twenty years experience working with and educating adults. In addition to being the owner of the Burwell School of Photography, he is a contributing editor and regular columnist with Outdoor Photography Canada Magazine. Paul has been a finalist in the Veolia 'Wildlife Photographer of the Year' worldwide competition in 2009, 2010 and 2013 and was named a 'Top Wildlife Shooter' by Popular Photography Magazine in 2010. Through the various classes and workshops I teach, I inevitably run into a number of students with professional photography aspirations. More than a few of them however, seem doggedly determined to do everything they can to make their dream of professional photography impossible. I’m nothing, if not a helper. So if you really want to sabotage your pro photography aspirations, here, presented in traditional count-down order, are 10 ways to make sure you’ll never turn your dream into a profession. This is the final post in the series of my travels during 2013 and covers the second week in December when we spent five nights in Rome - The Eternal City. The weather was good (certainly when compared with England!) with sunny days and a temperature of around 14C. The one really big advantage was the lack of queues at the tourist attractions. There is so much to see in Rome that you do not want to spend time queuing. We spent four full days and still did not see everything! We had rented an apartment with this great view of St Peters and the Vatican City. On our first full day we did what most visitors to Rome do, and that was visit the Colosseum and the Forum. The Roman Forum, (Forum Romanum), was the central area of the city around which ancient Rome developed. It was designed by the architect Vitruvius with proportions 3:2 (length to width). From left to right are the remains of the Temple of Castor & Pollux, the Arch of Septimius Severus and the Temple of Saturn. The following day we visited St Peters and the Vatican City. We climbed to the very top of St Peter's Dome taking an elevator to the roof level and then climbing 320 steps inside the dome to reach the platform at the very top - fortunately the view was worth it! View from the top of the dome of St Peter's Basilica overlooking St Peter's Square. It was taken early in December and the Christmas tree is being erected and the thousands of spots are plastic chairs. After leaving St Peters we went into the Vatican Museum and, amongst other things, we visited the Sistene Chapel where the view of the ceiling is magnificent - unfortunately photography is not allowed there. I did however take this view looking down the spiral staircase in the museum. Finally, as it was December while we were in Rome, I will end with this image showing the Christmas lights along the Via Mario de Fiori at the junction with Via Condotti, near the Spanish Steps, Rome. You can view more of the images I took in Rome on my Flickr account. A couple of weeks ago I posted a few images from the first part of our cruise, covering Gibraltar, Dubrovnik and Koper, now we have got Christmas and the New Year over with (and I hope you enjoyed it), here are details of the second part, namely Venice, Malta and Seville. We left Koper and docked in Venice round about sunrise. We walked into the city from the passenger terminal, via the Rialto Bridge and into St Marks Square, where we went to the top of the Bell Tower for a great view of the city. Here is the junction of St Mark's Basin and the Grand Canal Venice, showing the Basìlica Santa Maria della Salute. Moving on from St Peters we walked around to view one of the classic views of Venice, the Bridge of Sighs, featuring another classic sight, that of gondolas. The enclosed bridge is made of white limestone and has windows with stone bars. It passes over the Rio di Palazzo and connects the New Prison to the interrogation rooms in the Doge's Palace. It was designed by Antoni Contino (whose uncle Antonio da Ponte had designed the Rialto Bridge) and was built in 1602. The view from the Bridge of Sighs was the last view of Venice that convicts saw before their imprisonment. The bridge name, given by Lord Byron in the 19th century, comes from the suggestion that prisoners would sigh at their final view of beautiful Venice through the window before being taken down to their cells. We left Venice and sailed on to Malta, and while there is a lot to see, I will just post this one image of Fort St Elmo, a fortification in Valletta. It stands on the seaward shore of the Sciberras Peninsula that divides Marsamxett Harbour from Grand Harbour, and commands the entrances to both harbours. Our final destination was the Spanish port of Cadiz, from where we had booked a tour to visit the beautiful city of Seville. Much of the beautiful architecture of Seville emanates from the Ibero-American Exposition held in 1929 to help promote trade for Seville.